Yesterday our lovely hairdresser came round. She a great girl whom I've known since she was an apprentice. She has been a great support over the years and started doing home visits when I was unable to get out due to Brett's cancer. She has firmly become a family fixture and has followed our ups and downs with great maturity even though she's young. If she hadn't started doing our hair at home I dread to think how bad I would look. I have never been able to put myself first and found it especially difficult over the last 4 1/2 years. Michelle, our excellent hairdresser is also very modern and imaginative which i am also very grateful for. She always managed to style Brett's stumpy cancer regrowth hair into tidy and trendy styles. But undoubtably it's her patience and tolerance of me, that I adore. The poor girl walks in and before she's managed to take her scissors out, I am explaining my latest mad vision. I see hair as fun. I grow it then have it all cut off, then grow it again. It's only hair - it grows back. There are never mistakes with styles only choices. If you have a cut that you thought would make you look stunning only to find that it makes you look like a man !! Grow it out. I have also been many colours over the years. Mostly blonde but I get bored with that. I had bright pink streaks when Brett was first diagnosed - it was a statement of non conformity - sod the world. Over the years I've observed the response is actually pretty standard amongst cancer mums. I've seen women with every colour hair imaginable. Some just shave it off to support their children when they lose theirs. Yesterday I opted to be a little brighter in colour. I had had my colour toned down when Brett was going through his transplant. I would have gone black if Michelle had let me. I was how I was feeling but she wouldn't budge, it was a definite No! from her. So yesterday Michelle suggested blonde, red and a copper. I just let her get on with it, she always reads my moods like a psychic and I trust her which is massive compliment to her. 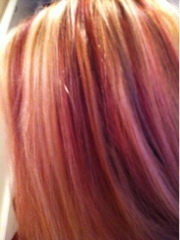 I think I was too severe with my washing it out as its got a little tinge of pink to it. I think it's ace. Perfect. Happy, sparkly, happy, relieved and did I mention happy. Life's great and I've got pink hair to match.